Nutiva Coconut Manna is an organic coconut butter. This tropical melt in your mouth treat is made from pure dried coconut flesh. Enjoy it straight from the jar or warm it up to spread the goodness. Spreads easily at temperatures above 23°C. The red or brown specks are characteristic of natural coconut products. 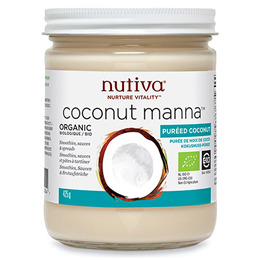 Below are reviews of Nutiva Organic Coconut Manna - Organic Superfood - 425g by bodykind customers. If you have tried this product we'd love to hear what you think so please leave a review.